In May last year I commented on six Roman limestone funerary busts that surfaced on the London market. They had appeared on the London market in 1998 and were accompanied by a "French passport". Three were unsold and are back on the market (now Bonhams 28 April 2010, lots 399 , 400  and 401 ). I wonder which dealer handled them and who has consigned them to this sale. 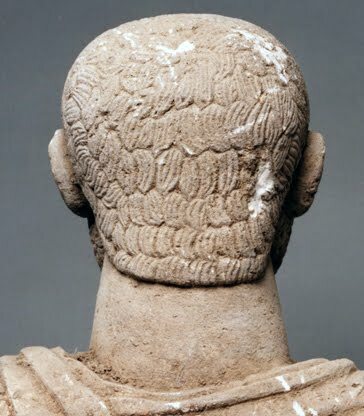 Detail of the rear of the head of a Roman limestone statue.